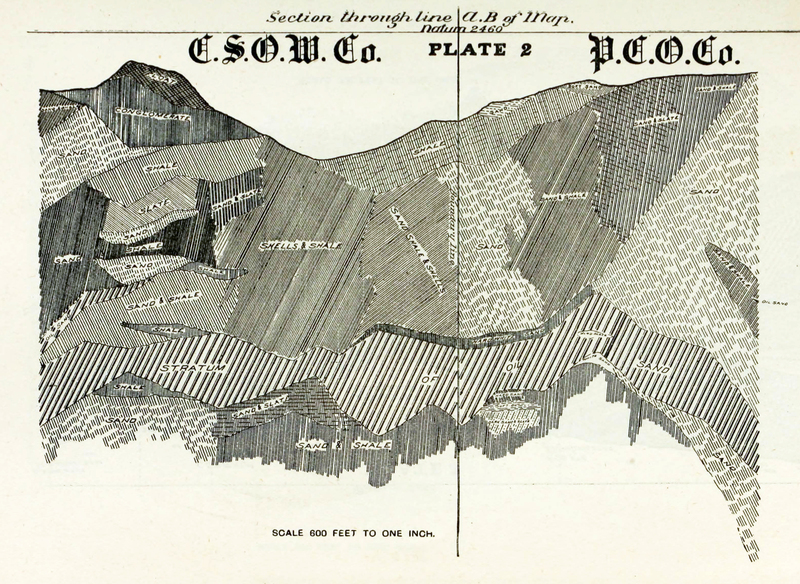 SCVHistory.com | The Pico Canyon Oil Field | Report by Edward North, with Map & 12 Plates, 1890. The Pico Cañon Oil Field. Excerpt from Annual Report by State Mineralogist, Period Ending 12-1-1890. 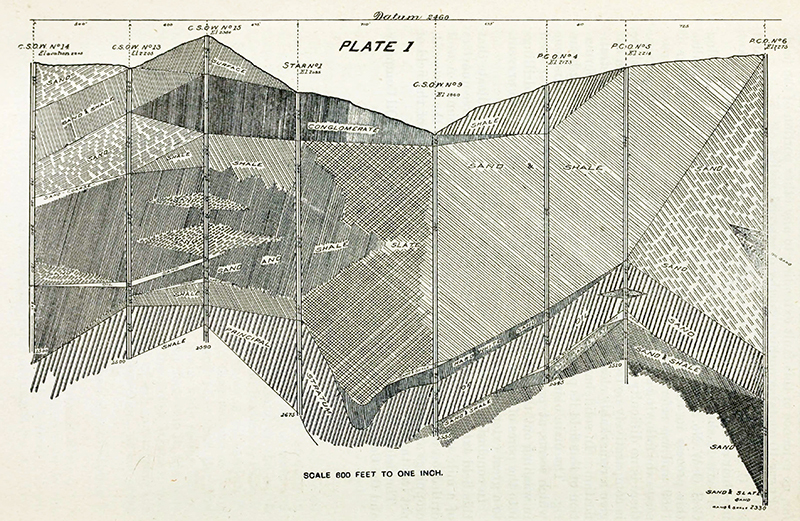 "Late investigations ... tend to prove the existence ... of a fault" in the stratification. A major earthquake, centered in Pico Canyon, struck three years after this report was filed. The Pico Cañon oil field (the oldest and best known oil-producing territory on the Pacific Coast) is situated in Secs. 1 and 2, T.3N., R.17W., S.B.M., in Los Angeles County. The nearest shipping point is Newhall, seven miles distant, to which point the oil is conveyed by a pipe-line. The country in which the oil is found is mountainous, the main cañon being cut, by action of water, through the sharply pitched strata which rise precipitously to a height of five hundred to seven hundred feet above the bed of the stream. With one exception, the oil throughout the entire field is practically of uniform quality, being a green oil of an average gravity of 40 degrees Baumé. The exception referred to is the product of C.S.O.W. Well No. 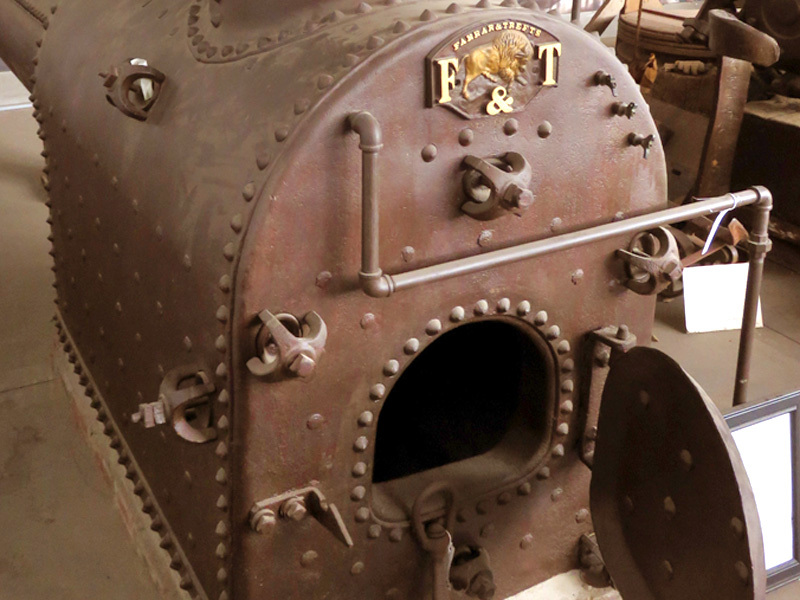 13, which contains such a percentage of paraffine as to seriously interfere with pumping at times, the paraffine clogging the tubing and coating the sucker-rods to such an extent as to necessitate steaming the entire "string" of tubing. Aside from the presence of paraffine, the product of No. 13 does not differ materially from that of the remainder of the district, nor is there any noticeable sign of paraffine in any other well in this field. As No. 13 is upon the western limit of the developed field, however, it is quite possible that an extension of development to the westward might show paraffine to be a feature of the oil in that locality. The development thus far shows an oil-producing field of a maximum extent of eight hundred and forty feet in horizontal breadth, and three thousand six hundred and sixty feet in length, the oil sand conforming considerably to the general contour of the country. It has been commonly supposed that the oil-bearing sand came to an abrupt termination on the south in a "break" in the stratification, from which "break" croppings indicate that the strata fall away to the north and south at angles varying from 45 degrees to 65 degrees from the horizontal. Late investigations, however, tend to prove the existence in the "break" of a "fault," on the south side of which the oil-bearing sand-rock lies at a greater depth than on the north. The statistics of drilling operations, while very full as to most of the wells in the district, give but little material upon which to base a theory as to the depth and pitch of the oil sand on the south side of the "break." The only reports bearing upon this point are those of C.S.O.W. No. 8. The first hole drilled here found the oil sand at eight hundred feet below the surface. In attempting to deepen the well, a set of tools was lost in which was impossible to "fish" out. Another hole was then drilled forty feet south of the first, where the oil sand was encountered at eight hundred and fifty feet, showing pitch of 125 per cent to the south. This seems to establish, beyond a reasonable doubt, the fact that No. 8 was on the south side of the "break." A reference to the cross-section of C.S.O.W. Nos. 8, 18 and 15, Plate 7, shows a fault of five hundred and sixty feet, should the oil sand "A," of No. 8, correspond to the oil sand "B," of Nos. 18 and 15, and eight hundred and ninety-five feet should correspond to the oil sand "A," of Nos. 18 and 15. As No. 8 was drilled ten feet into a second stratum of oil sand at the time drilling was discontinued (the futility of all attempts to case off water rendering further drilling useless), would appear that the strata "A" correspond, making a fault of eight hundred and ninety-five feet. But three productive wells have been drilled on the south side, all of which have been located within one hundred and fifty feet of the probable line of cleavage. Of these, C.S.O.W. No. 8 (the only one finding any thickness of oil sand) was producing fairly at the time was "plugged," as above stated. P.C.O. No. 11, after being pumped constantly for over nine years, now (July, 1890) producing 46 per cent as much oil as when first completed; and Hill No. 3, while producing fairly well, was flooded with water through the action of some chemical in the water which ate through the iron casing. 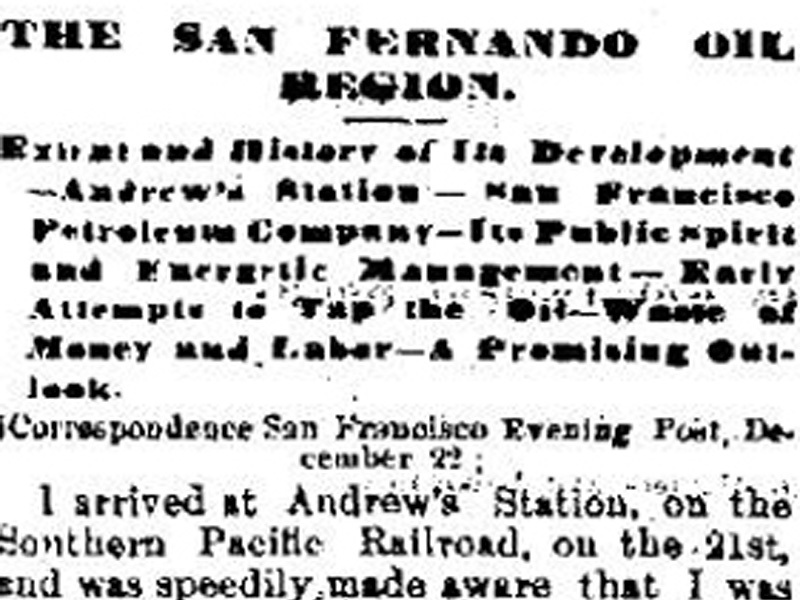 Of the two last named, neither show sufficient oil sand to account for its production or staying qualities, P.C.O. No. 11 having but twenty-five feet, and Hill No. 3 none at all. Both got their oil in "shells," term by which oil drillers designate thin laminae of sand and shale alternating with a hard, impervious rock. 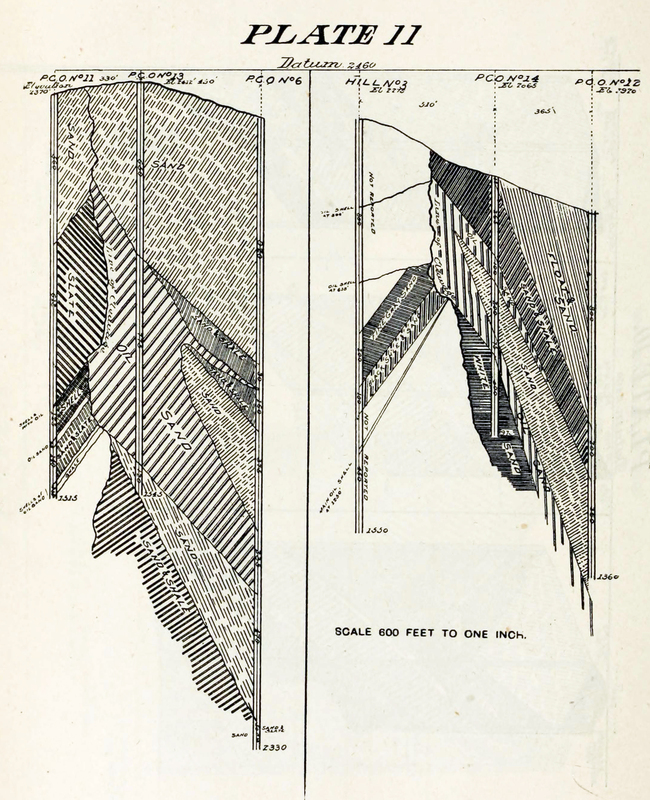 Both of these wells being so close to the probable line of the "break," seems quite likely that they have drawn their oil supply, through these shells, from the large body of oil sand on the north side (see Plate 11). Of the five "dry holes" drilled on the south side, Nos. 10, 11, and 16 (C.S.O.W.) all failed to go deep enough to strike the main oil sand, conceding a fault of eight hundred and ninety-five feet, and a dip of 125 percent. While Nos. 10 and 16 both found a little oil, it seems quite probable that this leaked through some crevice from the oil sand on the north side of the "break," as shown in Plate 9. As to the remaining wells (Hill Nos. 1 and 2), there is no formation reported sufficient to diagram, nor are there sufficient data regarding the north side of the "break" at this point to give any reliable clew to its location. On the north side of the "break," the greatest horizontal breadth of the developed field is from C.S.O.W. No. 2 (which is supposed to be almost in the line of cleavage) to C.S.O.W. No. 9, a distance of eight hundred and forty feet (see Plate 9). Following the angle of the oil sand, this would give, between the points pierced by these two wells, an actual breadth of oil sand of one thousand five hundred and fifty feet. The average dip of the formation on the north side of the "break " is 161 per cent on the C.S.O.W. territory, and 165 per cent on the P.C.O. Conceding a uniform breadth of oil sand of one thousand five hundred and fifty feet, and figuring the pitch at the proper angle where known, and the average where unknown, a breadth of field is established (see map) which is thought to be sufficiently conservative in its estimate to be practically reliable. That the field is broader than the one thousand five hundred and fifty foot line shows, is extremely likely, as the average vertical thickness of the oil sand in the wells along the north line of the developed field (Plate 1) is two hundred and fifty-four feet, with no marked indications of its "pinching out." But two wells have been drilled far enough north to raise any question on this point: P.C.O. Nos. 7 and 12. No. 7 was drilled to a depth of two thousand four hundred and twenty feet below the datum line, and found but slight traces of a black oil. Lines run from Nos. 9, 3, and 18 (P.C.O.) to No. 7, intersecting the line from Nos. 5 to 6, show, from their respective wells to the points of intersection, dips of 213 per cent, 163 per cent, and 280 per cent. Extending these lines on the same angles to No. 7, they give, as the average depth below the datum line at which the oil sand should have been found, two thousand four hundred and thirty-five feet. As the well was drilled to two thousand four hundred and twenty feet only, there is a fair probability that it did not go deep enough to thoroughly test the matter. P.C.O. No. 12 seems to have been drilled to a sufficient depth could we [sic] be assured that the dip of the oil sand did not exceed 165 per cent; but having no producing well opposite No. 14 from which to draw a logical conclusion as to the dip, and noting a dip of 230 per cent from P.C.O. No. 13 to No. 6, it seems quite possible that this same pitch should prevail farther east, throwing the oil sand to a depth of one thou- sand eight hundred and ninety-one feet below the datum line at No. 12, while that well was drilled to a depth of but one thousand eight hundred feet. As shown in Plates 1 and 3, there is a stratum of very light oil overlying the main body of oil sand in C.S.O.W. Nos. 6, 12, 13, 15, 17, and 18. The distance between the two strata varies from one hundred feet in No. 13 to three hundred and thirty feet in No. 18. C.S.O.W. No. 14 had a slight showing of this light oil, but drilling was suspended when but three hundred and fifty feet below it. It does not seem impossible that a few feet farther might have found the main oil sand. C.S.O.W. No. 17 would have been drilled deeper but for a body of quicksand which caught a bailer and rushed into the hole in such quantities as to effectually prevent "fishing" it out. P.C.O. No. 15 (Plate 6) found the oil sand at a proper and consistent depth, as compared with Nos. 3, 13, and 14, but it being impossible to "case off" water, owing to the seamed or porous nature of the rock, the oil was forced back into the sand, and the well has never been a producer. A careful study of the above facts seems to confirm the belief entertained by the owners of the property, that the limit of the field has not been reached in any direction. Regarding the accompanying plates, it is necessary to say but little, for, as a rule, they are self-explanatory. All of the longitudinal sections show that there is but one stratum that is continuous from one end of the field to the other, viz. : the main body of oil sand. 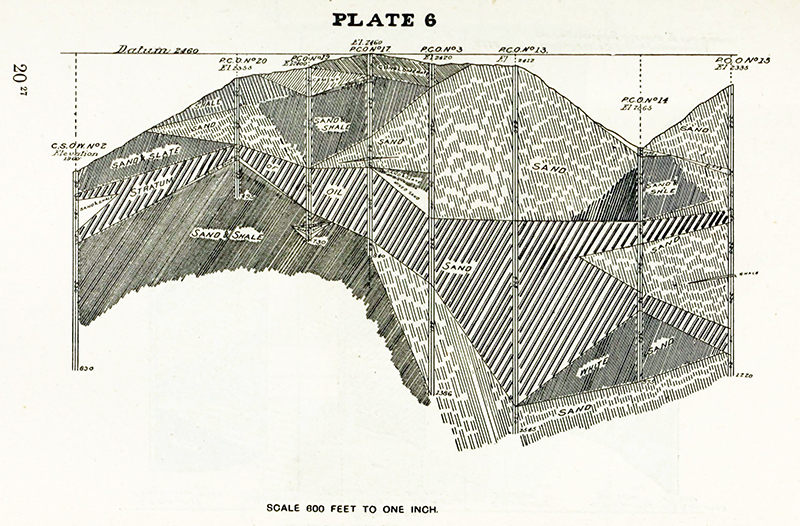 The cross-sections illustrate the very heavy fall from the "break" in each direction. Plate 1. 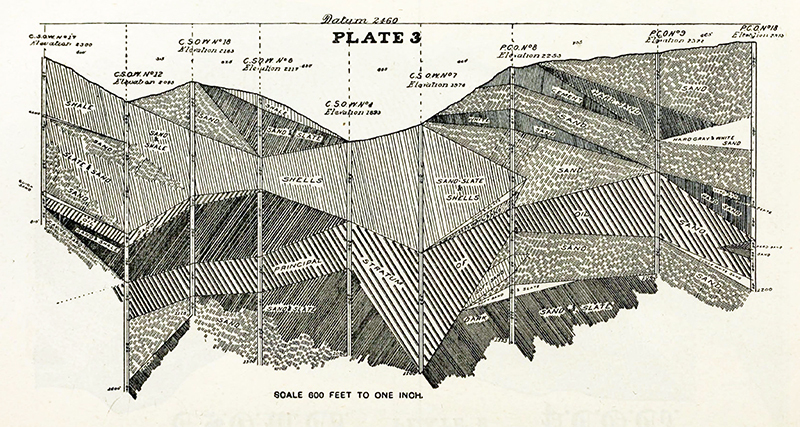 The most noteworthy features of this plate are the "floating" strata in C.S.O.W. No. 15 and P.C.O. Nos. 5 and 6, the peculiar undulations of the oil sand (which, however, are noticeable in all of the longitudinal sections), the deep "gouge" between Star No. 1 and C.S.O.W. No. 9, and the sudden change from the large body of sand and shale in P.C.O. No. 5 to the immense thickness of sand in P.C.O. No. 6. Plate 2. This plate is noticeable on account of the many floating strata, the sudden change at the boundary line between the P.C.O. and C.S.O.W., from a formation of sand, shale, and shells to a body of solid sand, and the peculiar contractions and expansions of the oil sand. 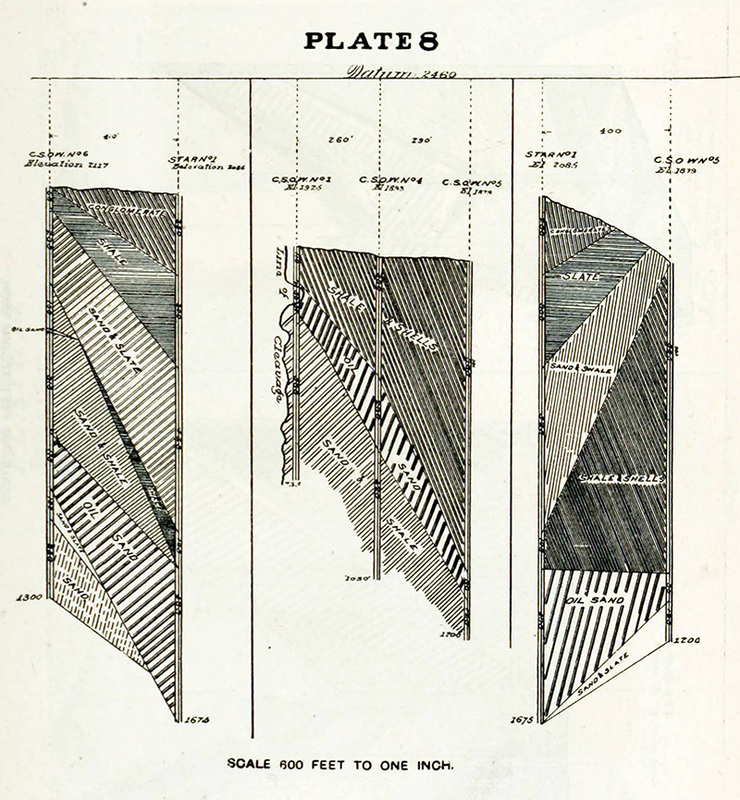 Plate 3 shows, as its most salient features, the great thickness of oil sand in C.S.O.W. No. 7, the great contraction between No. 7 and P.C.O. No. 8, and the expansion from No. 8 to No. 9. 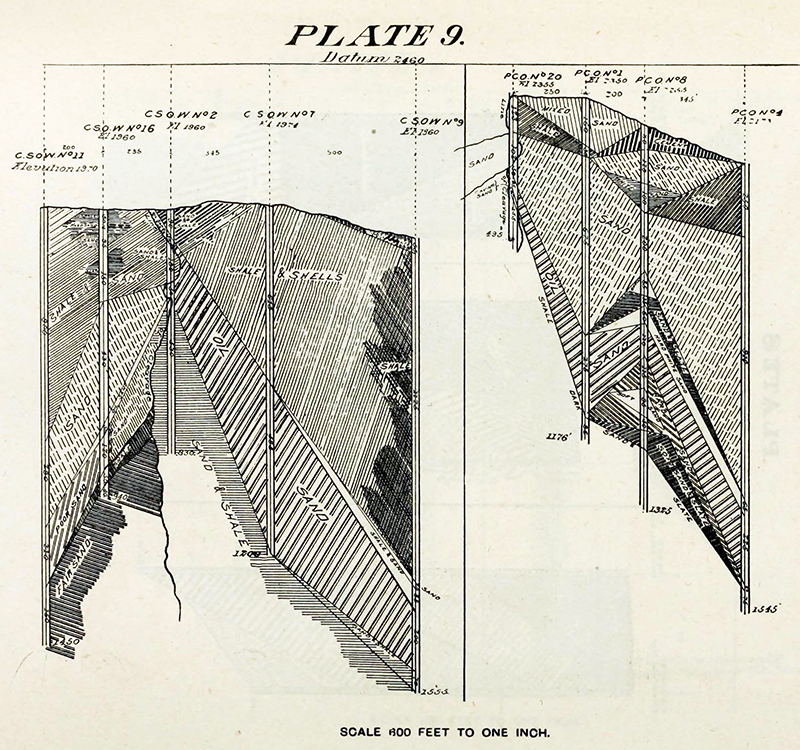 Plate 4 shows much the same characteristics as Plate 2. Plate 5 shows a stratum of sand and shale in the midst of the oil sand in C.S.O.W. Nos. 1 and 2. As these wells are nearly or quite in the line of the "break," it seems not unlikely that a body of sand and shale from the south side has been forced into the oil sand on the north side in the manner shown in Section 2, Plate 8, and Section 1, Plate 9. 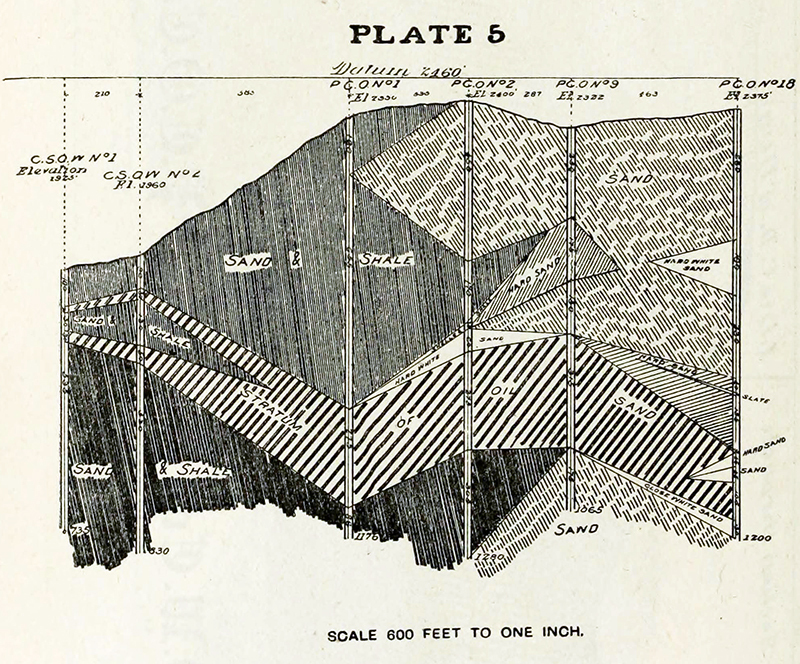 Plate 6 is noticeable chiefly for the great thickness of oil sand in P.C.O. No. 13, and for the stratum of barren sand diagrammed as being wedged into the oil sand in P.C.O. Nos. 14 and 15. That the first stratum of oil sand in No. 14 is a part of the main body seems likely, from the fact that when the drill was but eight feet into the hole filled up two hundred feet with oil, and when the lower stratum was tapped produced an unusually large amount of oil, considering the thickness of oil sand pierced, thus arguing connection, at no great distance, with larger body of the oil-bearing rock. 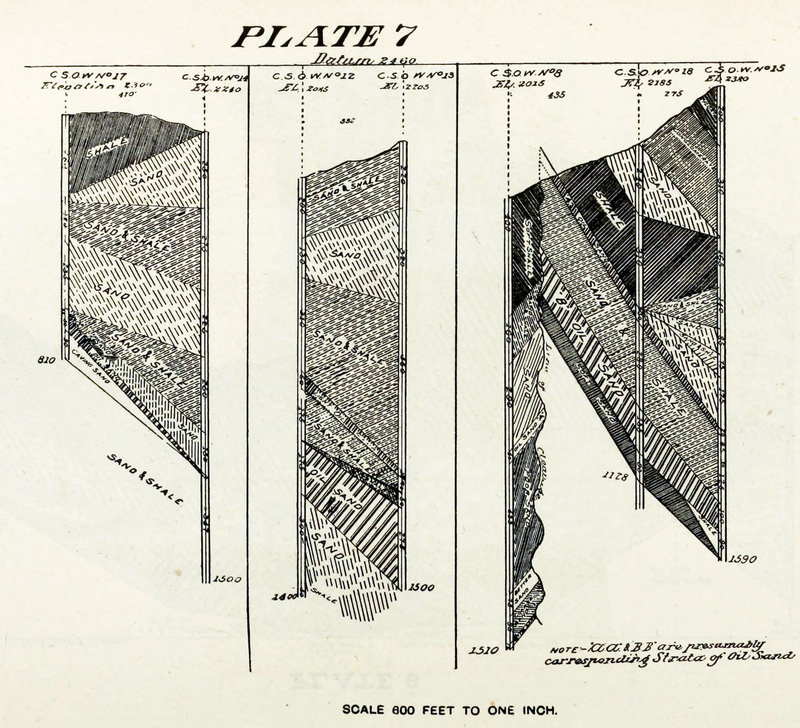 Plate 7 requires no especial explanation other than that of Section 3, which has been given above. Plate 8 requires no explanation other than that given of Plate 5. Plate 9. 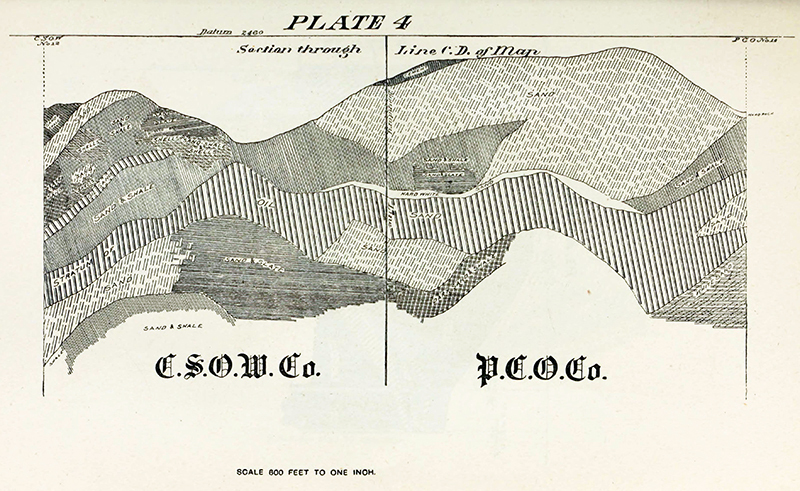 A very peculiar feature of Section of this plate the steep, downward pitch from P.C.O. No. 20 to No. 1, the following slight ascent from No. 1 to No. 8, and the ensuing rapid decline to No. 4. This seems to indicate a minor fault between No. 1 and No. 8. There is, so far, no evidence of this fault extending to any other portion of the field. Plate 10 contains nothing worthy of especial notice. 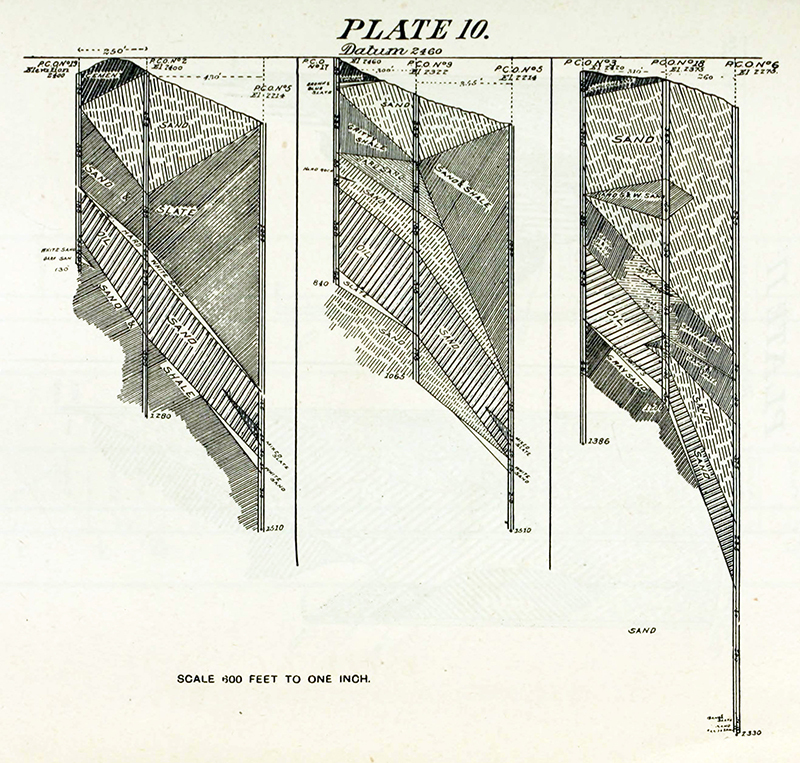 Plate 11 noticeable chiefly for the enormous thickness of oil sand in P.C.O. No. 13. The theory as to P.C.O. No. 11 and Hill No. 3 drawing their oil from this body of sand has been fully explained above. Plate 12 shows in full detail the formation encountered in drilling C.S.O.W. No. 19 by the diamond drill process. The attempt to utilize this process in the drilling of oil wells was made in the summer of 1889, and was referred to in the report for that year. This process possesses the following advantages over the ordinary rope-tool process, viz. : there is no difficulty in drilling a perfectly round, straight hole; there comparatively no trouble from "fishing jobs;" and the cores taken out give remarkably clear insight into the formation and dip of the stratification. In solid, hard rock its work rapid, but in the shale formation of this field its progress much slower than that of walking-beam rig. The main objection to as shown in this field, however (and one which seems, at present, to be insurmountable), that the water used in washing out the drillings seems to have forced the shale drillings into the pores of the oil sand, cementing up so tightly as to prevent, to great extent, the oil from oozing into the hole. In conclusion, it might be well to state that croppings indicate that this field extends in a westwardly direction from half to three quarters of mile and apparently ends abruptly on the Rancho Simi. A well drilled on this ranch, however, failed to get any oil. To the eastward, croppings and oil seepages indicate a probable extension of the field of not less than six miles in this direction. The field is controlled and operated by the Pacific Coast Oil Company and the California Star Oil Works Company. BELOW: Click each plate to enlarge.